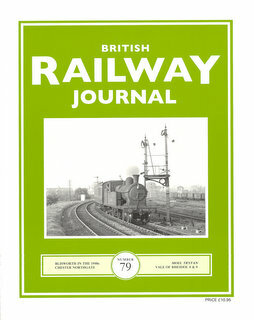 Great to see another issue of this lovely journal, articles include Blisworth in the 1940s, Chester Northgate in May 1949, two good narrow gauge feautures, Adrian Gray on "Moel Tryfan" and Vale of Rheidol numbers 8 and 9 in pictorial detail, plus more besides, including an utterly glorious feature on LMS camping coaches by Mike Fenton. Three main articles in this issue, Leamington Spa Avenue, an appealing follow up on the subject of GWR camping coaches by Mike Fenton, with some charming personal memories and beautiful photography and a detailed look at "The Crumbles Branch" in Eastbourne. This last is a fascinating piece of railway history about which I knew nothing, a line built to exploit shingle on the coast but also serving an electricity and gas works. Post War it was partially converted to narrow gauge and this article details the whole thing in great detail, including detailed maps and period photoraphs - 33 pages of obscure railway joy! Edgware Road, Sturton GC and Radstock West also feature in photographs in this issue. An obscure Scottish WW2 military port railway, Wilton GWR in 1921 and an extended piece on Henstridge S&DJR.